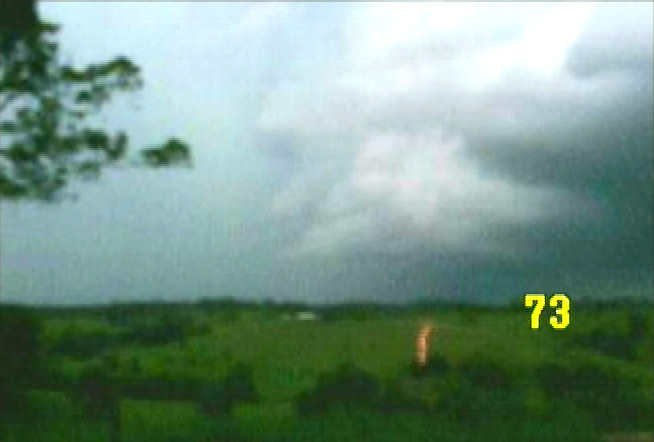 On Thursday evening (08-01-04) there was a thunderstorm to the North of Gympie that moved East across the Goomboorian area. During the height of the storm a woman was struck by lightning while she was in the process of opening the steel gate of a child minding center in Goomboorian. She was taken to Gympie General Hospital overnight for observation. As it was not dark enough to capture any still lightning shots I recorded some of the storm footage in video mode on my camera. The resolution is not brilliant and the auto-focus drops in and out but I have managed to record something quite unusual. The frame rate of the captured video is 15 fps, clearly just before the main CG strike on frame 75 there is a red ground flash on the hill to the front of me in frame 73.